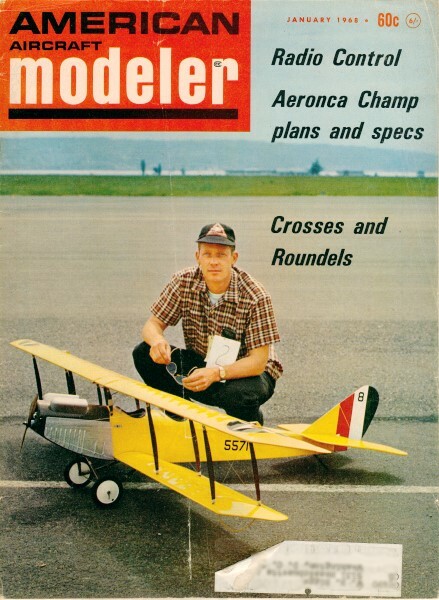 December 1967 was the last edition of the Academy of Model Aeronautics' American Modeler magazine, and this January 1968 edition of American Aircraft Modeler was the first with the new name. Interestingly, editor Bill Winter does not mention the name change in his monthly "Straight and Level" column. For that matter, I checked up through the May issue and still no mention. Printing and distribution lagged publication for many months back in the day, but usually comments of previous editions began appearing within three or four months (i.e., by March or April for a January edition). Nothing. Anyway, here are some interesting tidbits from the worldwide modeling world. 1967 Junior Champion of the U.S. model rocket Nationals Charles Dueller also appears in the "Milestones in Mankato" article this month. 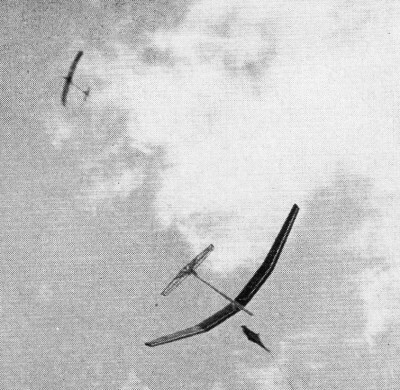 Two of many Nordic type A-2 gliders which flew at the Free Flight world championships in Sazena, Czechoslovakia last August are shown above. Still on the towline is the model of U. S. team member Hugh Langevin. The grace and serenity of sailplane flying has led to the use of the words "Silent Plane Meet" to describe gatherings of soaring enthusiasts. Under rules of the Federation Aeronautique Internationale the towline used to launch Nordic gliders is limited to 50 meters (164 ft.) in length. Maximum weight allowed is just under one pound (14.5 oz. ), The three-man team, from Czechoslovakia won the 1967 championship. Meet" placings and extensive photo coverage was provided in last month's Model World section. The next world championships for Nordics is scheduled for 1969, with Spain as tentative host. 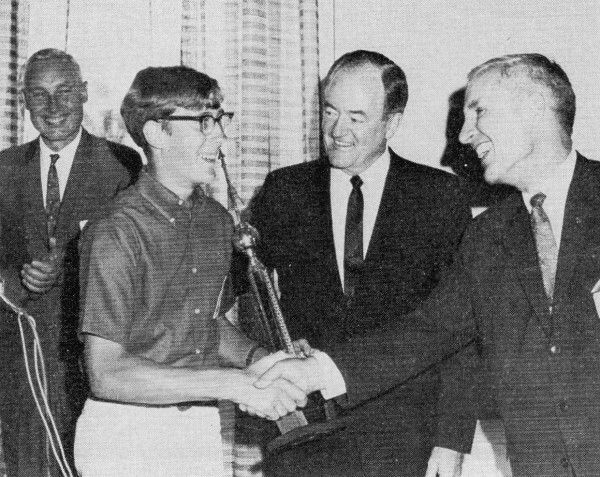 Vice President Hubert Humphrey was on hand to award the championship prizes at the U. S. model rocketry "Nationals" last August - first time ever in this country that a government official of such high rank participated in an aeromodel event. The occasion was the awards banquet of NARAM-9, the ninth annual meet of the National Association of Rocketry at Mankato State College, Minnesota, as Charles Duelfer, 16, of Stamford, Connecticut, was presented the Junior National Championship trophy. Shaking hands with the champ is Leister Graffis, president of the Bendix Field Engineering Co., a principal sponsor of the meet. Also enjoying the show is R. V. Mrozinski, left, staff member of President Johnson's National Aeronautics and Space Council. For a look at what else went on during the meet's four days of competition, see further details in Countdown's complete report, p. 42. Also observing the meet at Mankato were several representatives of NASA, the U. S. space agency, with a view toward possible hosting next year at the Manned Spacecraft Center in Houston, Tex. This compressed-air driven model dates back almost 40 years but it's not grounded yet. 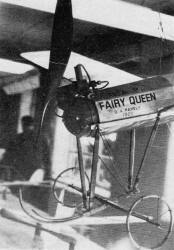 The model is part of a modern collection of antiques which are intended to be flown. Lt. Commander A. Greenhalgh of Berkshire, England, is the collector and also the builder of many replicas of famous old models. 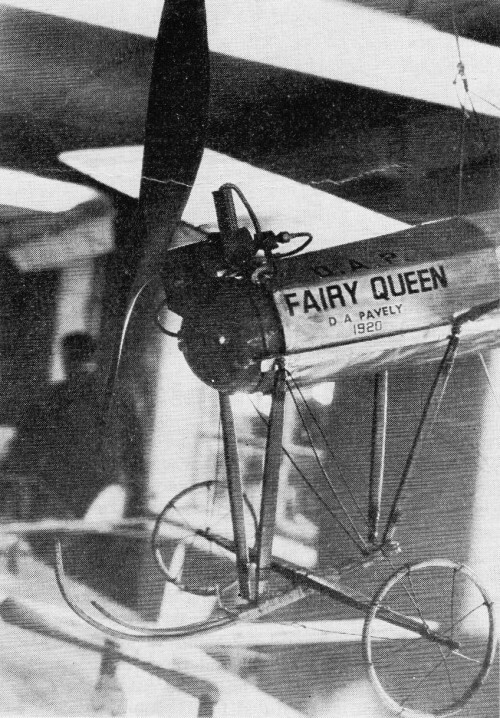 The 1920 Fairy Queen, however, is the original model, built by D. A. Pavely. It weighs 4 1/4 lbs. and has a wingspan of just over 7 ft. The engine is a three-cylinder rotary valve type of 5/8" bore and 3/4" stroke, which swings a 24 in. 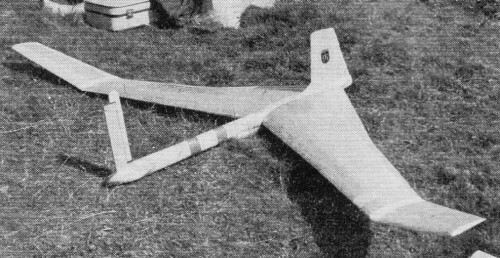 diameter prop. A compressed air tank 27 in. in length and four in. in diameter is filled to a normal takeoff pressure of 150 lbs. per sq. in. for flights which average one-and-a-half minutes. Bamboo, hardwoods and wire bracing are used extensively in the construction and the model is covered with oiled silk. The collection project also includes the filming of models in flight. Currently being sought are drawings of Joe Erhardt's 1930 and '31 Wakefield winner. 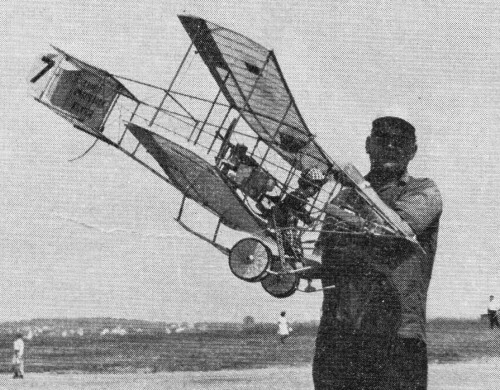 At a scale model meet held last June at Weilbach, Germany, near Weisbaden, a Curtiss 1905 pusher was entered by its builder, Hans Wilhelm Knaf. 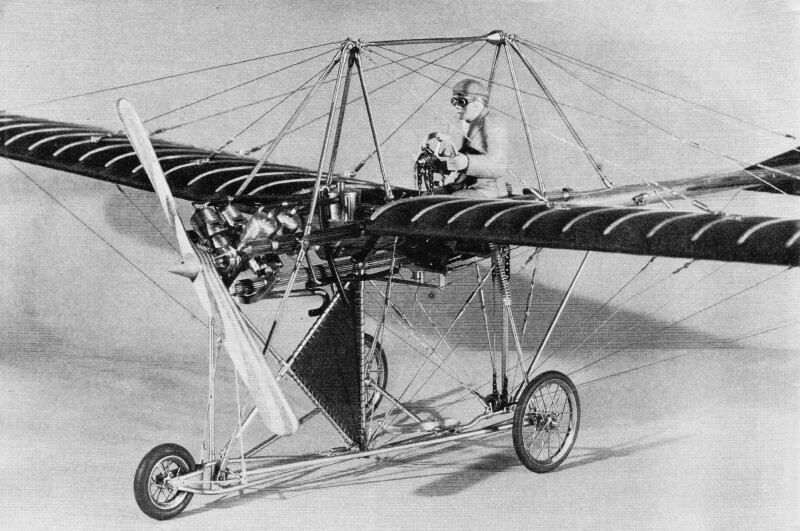 In the famous movie "Magnificent Men and Their Flying Machines" the Curtiss was known as the Phoenix Flyer and Hans' craft was modeled after the movie version. A Super Tigre 56 powered the model and German-made Simprop proportional radio gear was used for control. Flying was done by Germany's Junior Multi Champ, Heinz Elsasser, and was good enough to win second place. At least four of the winning models were of U. S. aircraft and several were built from American kits. Scale interest in Germany is high and there is an effort underway to include the category as an official event at the RC world championships which is scheduled for Germany in 1969. This tailless model flew very well in Italy last July during the Europa Cup slope-soaring competition held at Monte Tomba. The swept forward wing design showed good longitudinal stability and tracked into the wind just like more conventional models. To aid flight a magnetic or compass steering system is utilized to operate the rudder which is mounted above the nose boom. Compass steering is popular in Europe and official rules for this type of model have been adopted recently by the Federation Aeronautique Internationale. It is anticipated that the Europa Cup event, which has previously been limited to Austria, Germany, Switzerland and Italy, may develop into an official FAI International competition. At next year's Europa Cup meet, scheduled for Spitzerberg, Austria, more extensive invitations are being issued. One of the most outstanding models in the great collection of the Smithsonian Institution in Washington, D. C., is this one-tenth scale version of the 1911 Johnson monoplane. Authenticity of the model is assured by an unusual circumstance - it was built by the designers and builders of the original airplane! The model was constructed in 1959 by Louis and Harry Johnson of Terre Haute, ,Ind., who then donated it to the Smithsonian. The Johnson brothers are also well-known throughout the world for the thousands of boats powered by outboard motors which bear their name. The model is typical of the extremely high standards of craftsmanship required of Smithsonian models. Attention to detail is shown by rigging which includes real turnbuckles, spoked wheels, chain drive in the control system. No deadlines plague the modeler who builds for the museum - he is not expected to present his creation until he is ready for critical evaluation by museum experts. This is why the museum has a reputation for quality. That reputation also involves photography, as indicated by the excellence of this photo by the staff of the Smithsonian's National Air and Space Museum. 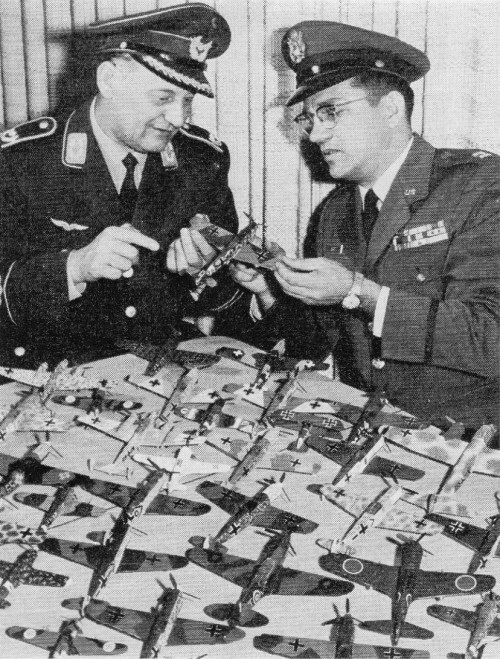 An Air Force officer who has assembled an armada of over 200 model aircraft has also become recognized as an authority on the German Luftwaffe. He is Donald E. Evett, shown on the right discussing one of his many versions of the Messerschmitt 109 aircraft with a German pilot, Major Wilhelm Klapper, who flew the real fighters in World War II. At least 16 of Evett's 109's are shown in the photo, but he has built over two dozen and he is credited with having the world's largest collection of models of this airplane. Evett is a specialist in markings and color and his research in these areas has led to modifications by model kit manufacturers of color schemes and decals to agree with his findings. The uniqueness of his collection, and subsequently an interview on Radio Free Europe some years ago, has resulted in a vast correspondence with modelers in many countries. The correspondence effort in itself has absorbed much of Evett's spare time effort. When he can work on models he averages about two weeks time to assemble and paint each, using an hour or two at a time. Evett has been building models since he was a young boy in the Pacific Northwest. He has continued steadily throughout a career which has included being commanding officer of the West coast headquarters of the Air Force's Communications Services. Collection represents over ten years of spare time work. Each year since 1961, at Cleveland, Ohio, the Ellyson Award has been presented for the best scale model of a U. S. Navy type, at the annual National Plane and Space Model Show. 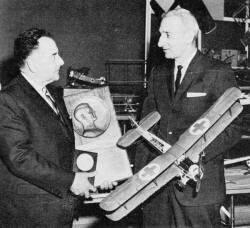 The award was originated by Dr. Paul Garber, shown at left, Curator of the Smithsonian Institution's air museum. It has been sponsored by the Grumman Aircraft Engineering Corp., maker of many famous Navy aircraft. The award is named after the first U. S. naval aviator and is given for superior authenticity and craftsmanship. The 1965 winner is shown holding his model which is a special Navy ambulance version of the famous DH-4 airplane of World War I. He is Joseph Birchacek of Ohio, a winner of numerous scale model competitions. His skill is further attested to by the fact that one of his models was accepted by the Smithsonian for museum display. The Ellyson award will be presented again at the 1968 show in Cleveland next April. There are also discussions underway to extend the award to a possible twice a year presentation by including the best Navy scale model at the Navy-hosted annual National Model Airplane Championships. Officials of the Smithsonian and the Academy of Model Aeronautics are cooperating on this project.